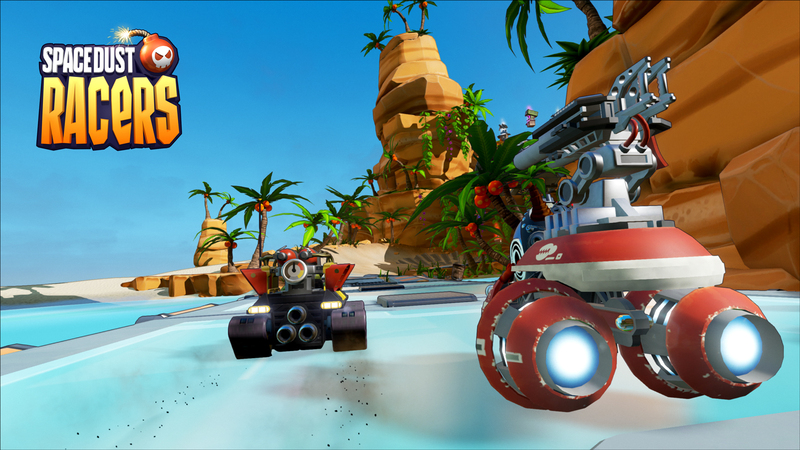 We’re back with another update and some pretty screenshots for Space Dust Racers. Wait, don’t I mean Space Dust Racing? After much discussion within the team, we felt that while racing is part of Space Dust Racers (in between the mayhem and carnage), the game is more about getting together with some chums, choosing a character, then systematically attempting to explode, bump, BBQ and shark-missile them into oblivion while trying to survive at the same time. 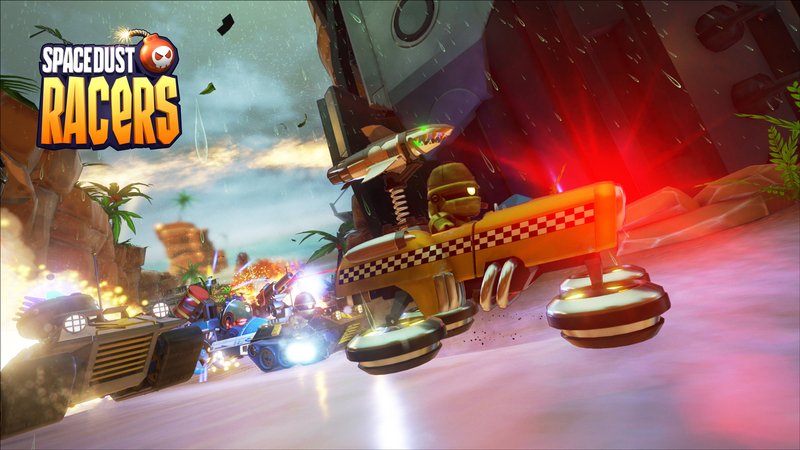 It’s deathmatch on wheels, hence the focus on characters over the act of racing itself. The name change also tied in nicely with a planned re-design of the logo, featured above. 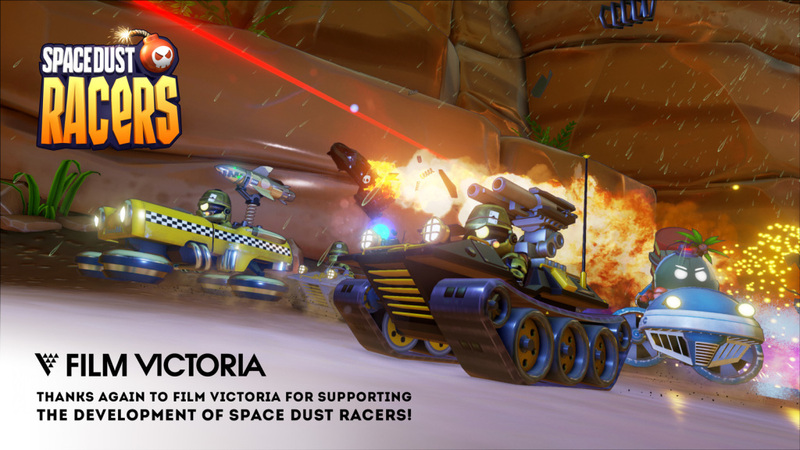 We also wanted to say thanks to Film Victoria for their continued support of Space Dust Racers and Victorian Game Development in general. We couldn’t make this game without their help and we are super appreciative! 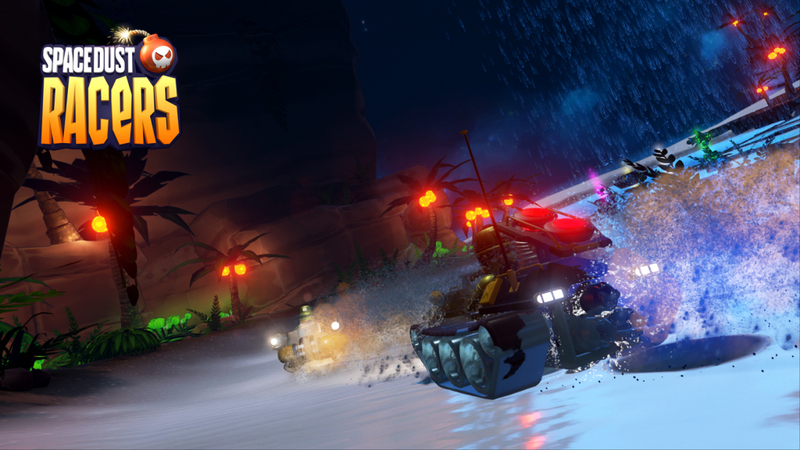 We’re currently working on an exciting new level for Space Dust Racers, however earlier this month the team worked on adding various weather and times of day to the Clawtopia level. 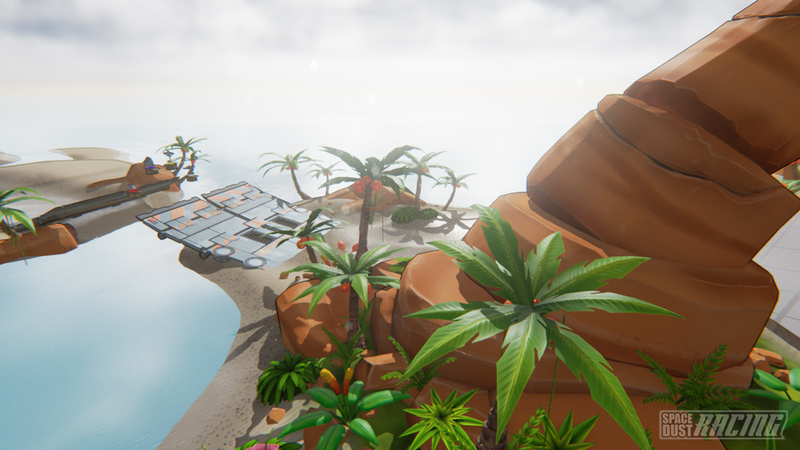 Below are screenshots showing the original tropical morning plus the new clear night and thunderstorm versions. Progress is continuing at a rapid rate with the gameplay, environment and vfx improving every day. Also – if you missed our last post showing early game-play footage, be sure to check it out here, but bear in mind the game looks a lot better now! 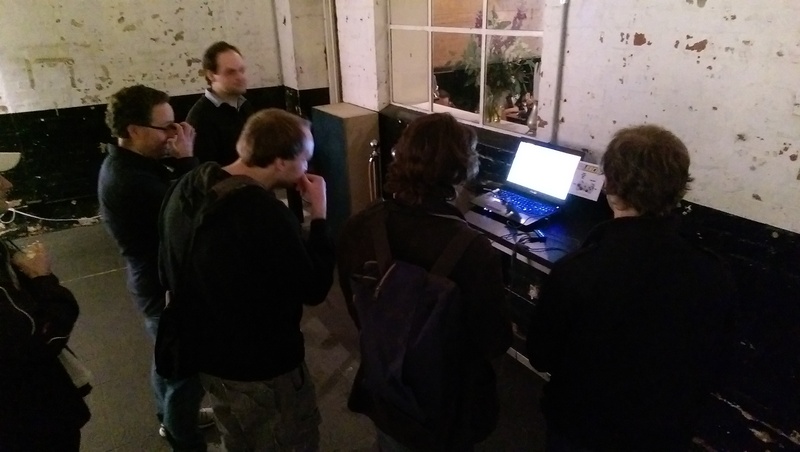 We took our Space Dust Racing milestone build to the IGDA Melbourne pitching night and got some great feedback. About 30 people wandered over and joined in the 4-player mayhem, and offered some great suggestions on things we could improve and their favourite elements. 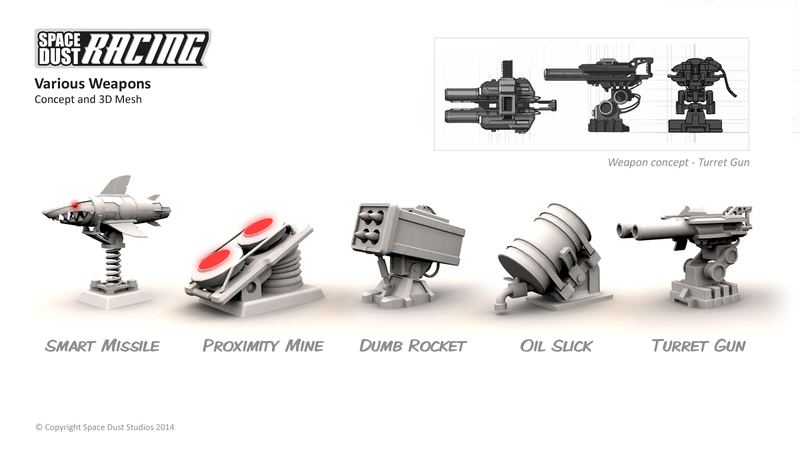 New features we’ve added include the ability to ram other vehicles off the track, auto-aiming laser sights for the turret gun, slow but sneaky homing on the smart missile, a passive shock shield which protects you from attacks and also acts as a melee weapon, and a more forgiving revision of the vehicle physics to ensure players remain in the game for longer. And thanks to Unreal Engine 4.3’s splines, we’ve added spline data for the race track, which has finally allowed us to create a silky smooth camera behaviour and easily give the AI racers some rudimentary knowledge of the track. 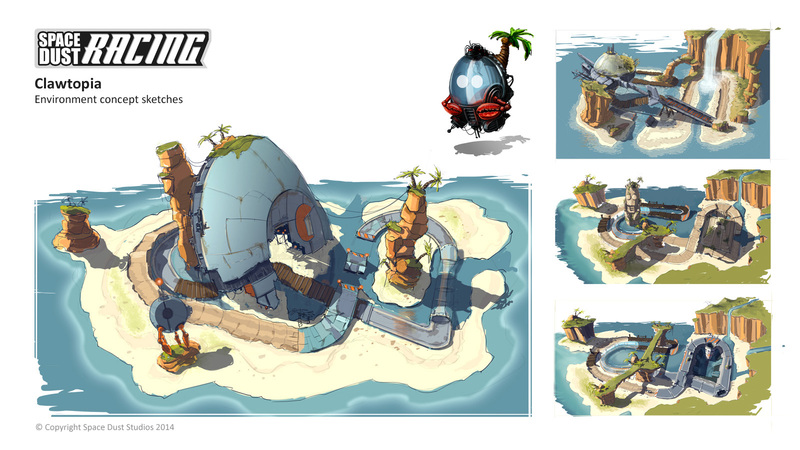 Clawtopia is feeling more and more like the alien tropical island we imagined in the early concept art. Pops has been heading up the creation of the terrain sculpting, plant creation/placement and it is really coming to life. 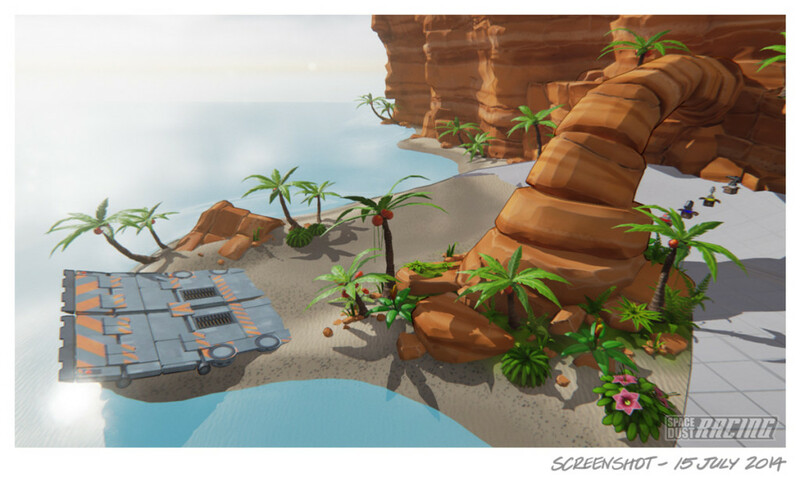 As final gameplay adjustments are made to track and obstacles, the remaining white-box assets will be replaced with final art and textured mesh. The vision for Clawtopia was that it should feel familiar but also alien, and that vibe is really starting to materialize. Obviously the enormous crashed flying saucer helps a bit! 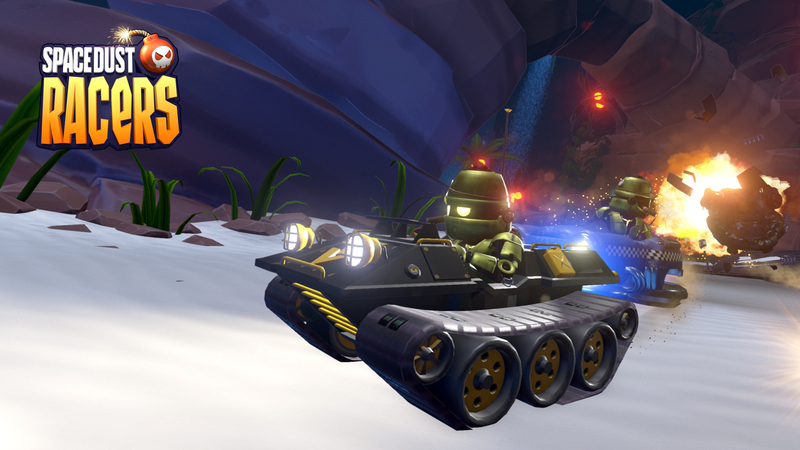 Clawtopia is Hermans’ home world, so unsurprisingly Herman will be the next Space Dust Racing character to be built. However… Grigs is first building out the geometry for his vehicle, which in keeping with his character is a fishy inspired hovering jet powered skiff (phew!). 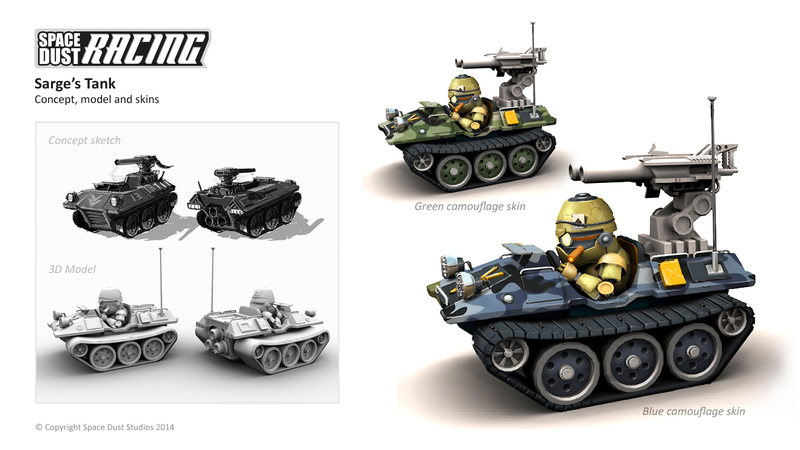 Several rounds of concepts were created from which the final design was refined to fit similar proportions to Sarge’s tank – you can see the early progress below. Well… that’s it from us for this development update. Is there any part of the game you’d like us to talk about? Leave your thoughts below in the comments. Space Dust Central has been super busy since our last blog post. The transition from Unity to UE4 is complete, models are being made, concepts scribbled, tech developed and gameplay implemented… and Beans has just continued being awesome. 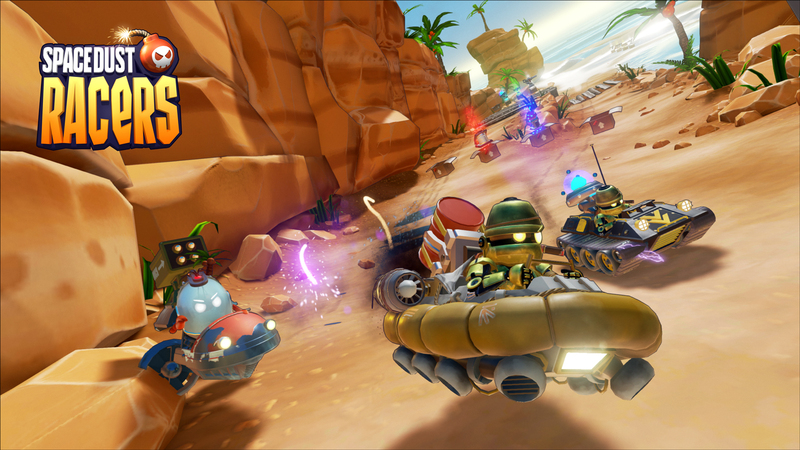 Just a few days ago, Michael stood up online multiplayer for Space Dust Racing. We’re able to create and join online matches, which all came together surprisingly painlessly thanks to the mature networking support in Unreal Engine. Despite our core gameplay focusing around couch co-op, we can already see the value in having an online multiplayer build so early in the development process. We can playtest remotely, and with Skype running in the background we’re finding this is great for brainstorming ideas while we race around the track. My my… is that a shark missile!? Yes indeed… mounted on a giant spring no less! Grigor and Pops have been building and animating our first batch of weapon models (there are more in the works). Obviously these are the raw mesh without texture, but it gives a good indication of where things are headed! Included is an orthographic projection of the Turret Gun in the top right, continuing on from the last blog post about art process. 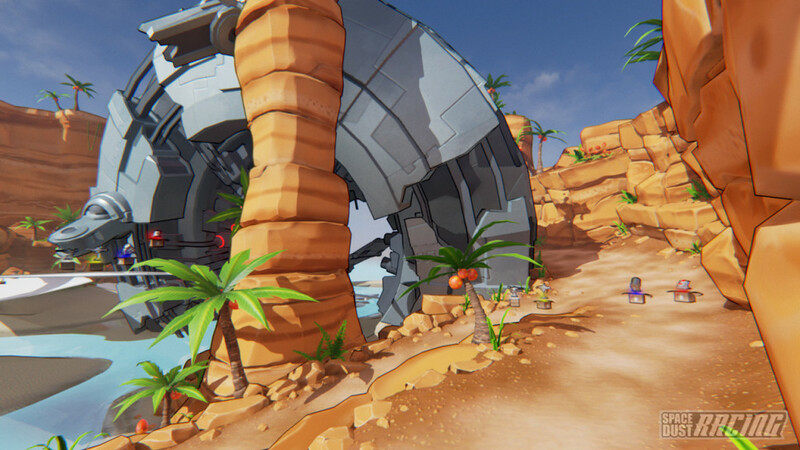 Below are some of the initial concept sketches – we wanted to get a cool contrast between tropical island and spacecraft wreckage, and also multiple terrain types within the one level. The actual track shape is different from what you see here – these images just show thematic direction. 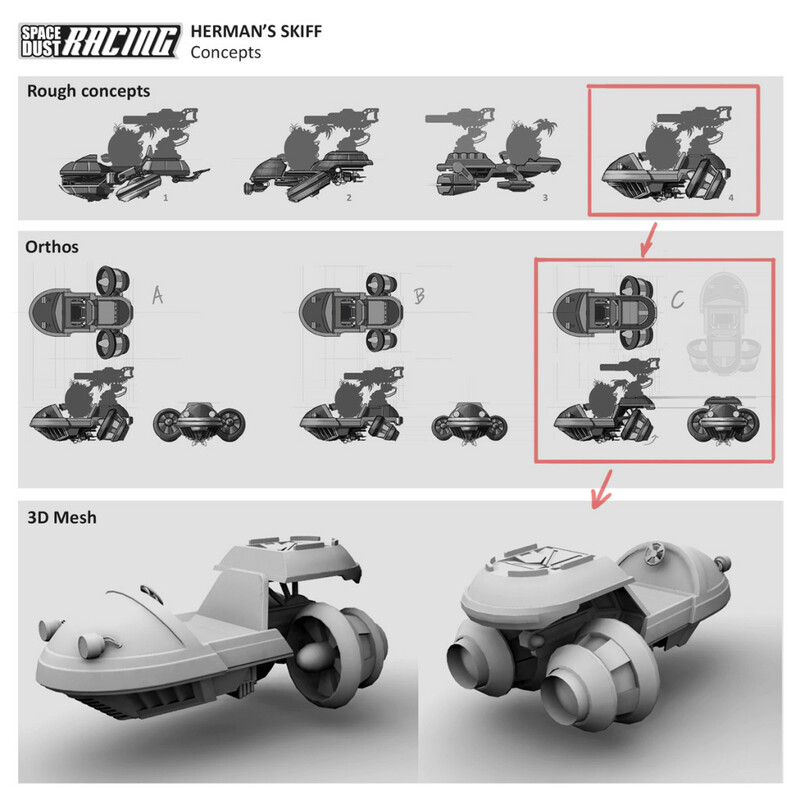 Continuing on from our last post, you can see the original tank concept sketch, and below it the final raw 3D model. 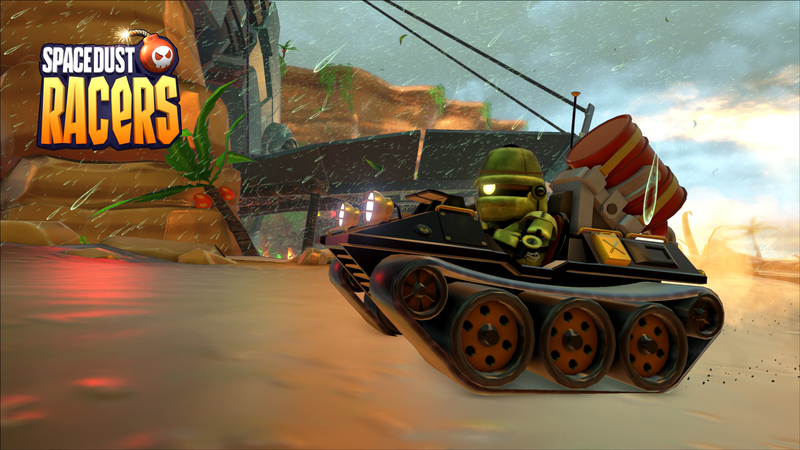 A few things changed along the way – like the tracks have been fattened up considerably, and the side of the cockpit altered so you can really see Pops’ cool character animations. On the right are concept paint-overs showing the skins we’ve decided to go with. Grigor is continuing work on the build of Sarge and his tank, so hopefully will have some images of the final product in the next post. That’s it for this post! Thanks again for stopping by to check out the development of Space Dust Racing. As always, if you’ve any comments or questions or thoughts, please post below!